Found commonly only in the north-eastern border areas of the Northern Province, as well as in the most northern parts of KwaZulu-Natal. In some Bushveld areas of the Northern Province, it is at the moment being re-introduced by gamekeepers. The most notable and unique feature of this antelope, is the total difference between the male and female nyala. While the male is grey-black with faint white stripes and very light brown legs in colour, much bigger, heavier and graced with a long pair of dangerous horns, the female is red-brown (almost chesnut) coloured with unmistakeably manifest white stripes, smaller, lighter in weight and without horns. The female also doesn't feature that sudden difference in colour between her upper and lower legs than does the male. 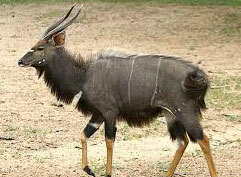 The nyala is a secretive, shy and docile antelope. This doesn't mean that the bulls don't have brutal fights with one another, although they sometimes settle the score simply by a male ritual which include a cocky circling of one another, arrogantly displaying themselves in negotiating aggression, until one of them backs down and thus granting the other his superiority. Of course, this often do lead to a fight, but it seems that the Nyala comes closest to proves that it's not only the fittest who have to survive. With the bushbuck, the Nyala are found in riverbeds, mountain forests or where the shadows in the bush allows for a dense hiding area.